Although there are many counter top materials, laminate is our most requested counter top surface material. 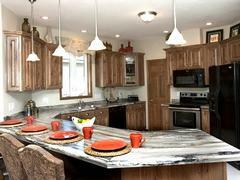 Laminate is 70% paper and considered one of the most environmentally friendly counter tops available. Wilsonart HD features AEON technology which provides three times the industry standard wear resistance and is five times more durable than standard laminate. The digital technology of Formica 180fx offers the true scale and impact of a full granite or hardwood slab. Laminate has the widest variety of color and pattern options, it is easy to maintain, and is one of the best values in surfacing options. Wisconsin Homes proudly offers the option of Corian solid surface and Zodiaq quartz countertops. Both are non-porous, high quality DuPont products and are available in a wide range of design choices. The 33-color Terra collection consists of five colors that use at least 20% pre-consumer-recycled resin content making it a great contribution to sustainable design.